Here at Williamwood Farm we appreciate that for many of our guests, their faithful dog is a cherished member of the family! Three of our four country cottages welcome dogs. GreyCraig, Williamwood & Beckhead Cottages are all Dog Friendly. One medium sized or two small dogs are welcome. No dogs are allowed in Dairy Cottage due to its location within the farm steading. 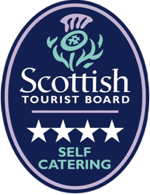 Beautiful #DogFriendly 4-star Self Catering cottages. #FarmHolidays are fabulous!